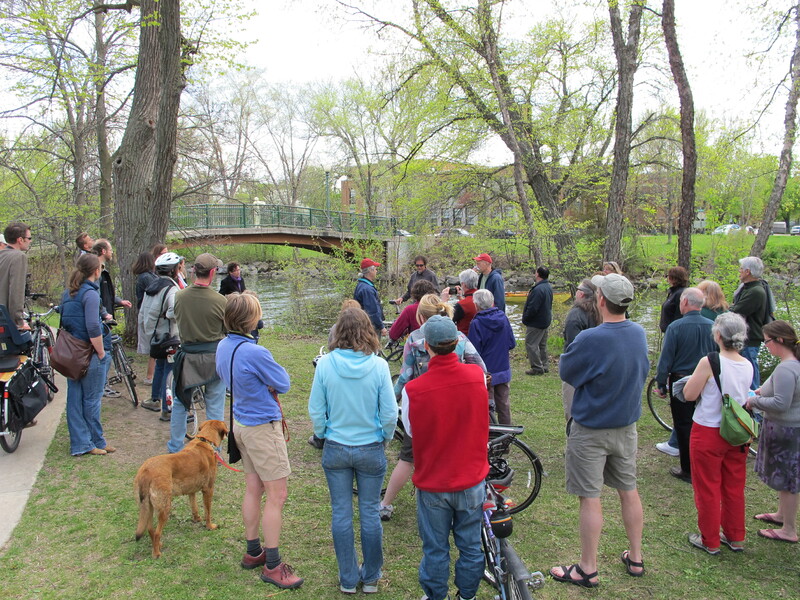 People gathered for a tour along the Yahara River with the artists and organizers. Thanks for visiting the website for Reflections from the Banks of the Yahara River. Five artists & five new works of public art were on exhibition from May 15 through June 15, 2014! The works highlighted the history of the Yahara River and Parkway, the geography of the landscape, the ecology of the region, and the culture of the neighborhood. These artists’ works were selected from a public call for submissions. We hope you enjoyed some time with the art in the Parkway. A blog post by Katie Vaughn at Madison Magazine! An article in the Wisconsin State Journal by Samara Kalk Derby. A live interview by Brian Standing with Jessica Becker, Helen Sarakinos, and Karin Wolfe on the Morning Buzz show at local radio station WORT (89.9FM). THANKS MADISON! Funding provided by the City of Madison Arts Commission BLINK! program, special funds for temporary public art. Thank you Sharon, for these AWESOME photos of the Yahara River! Thank you the City of Madison Arts Commission for support through the program for temporary art.